A brand new group exhibition comes to the bare walls of Dalston Superstore. Combining a mix of artists as carefully stuck together as the subject matter. 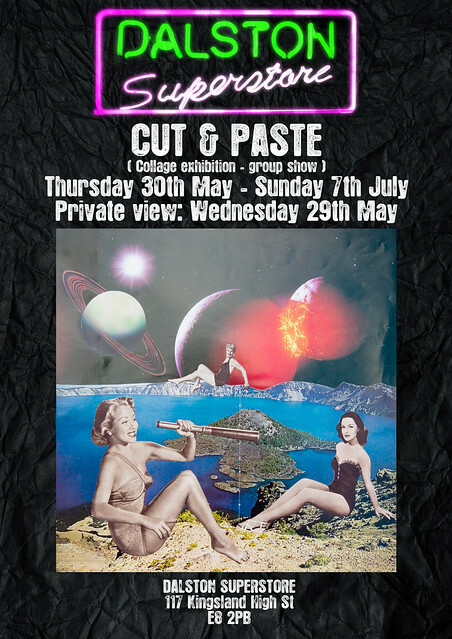 CUT AND PASTE will open your eyes to the world of collage. Combing artists from all walks of the artistic spectrum including graphic designers, fine artists, art students, curators and fashion designers. Bringing them altogether to create an exhibition that has been long in the making. For curator Saskia Wickins collage has always been a niggling obsession. Having a fascination with the Dada movement and most artists involved including Max Ernst and Robert Rauschenberg. Wickins has finally had the chance to explore what happens when you combine an assortment of artists with a subject so broad as collage. Collage has the ability of showing a position and time of society due to the nature of collecting ephemera often from ones everyday surrounding. With this brings a confused boundary between 2D and 3D allowing freedom within the work. 16 artists have been asked to contribute towards this exhibition; each of these artists work with collage but come to deal with the subject matter from entirely different angles. Including photography, digital construction and good old-fashioned paper on paper. Andrew Bever, Naomi Bird, Shafiq Dad, Georgia Gendel, Calvin Holbrook, Christa Joo Hyun, Anne Lacheiner Kuhn, Alex Noble, Sami Noir, Ewa Obrochta, Joshua Parker, Steven Quinn, Loulou Reloulou, Ryan Riddington, Sidonie Zou-Zou Roberts, Gary Russell and Saskia Wickins.